I have a few brands I love. Like many people, I fly Southwest any chance I can – even choosing connections and higher ticket prices just to stay in the brand. But we all know these consumer brands and their stories. Southwest, along with Ritz Carlton, Amazon, Chick-Fil-A, and the other darlings of customer experience (CX) have had their stories told often. What about business-to-business brands? Where are those CX stories? I love Computer Discount Warehouse (CDW). When I got my start working as a technologist at an architecture firm, I bought tech for the firm using the same mindset I did for myself. I looked for low prices and the best deal. I tried to save a buck wherever I could. I soon realized the cost of doing that at scale disrupted the office’s functions. A minor inconvenience for me as a consumer seeking the best deal could cause a business-threatening outage at work. Eventually, I found my way to CDW and made a major purchase with them. They treated me so much better than the other guys offering low prices and sweet deals. They got me everything I needed exactly as requested, on time, and at a fair (although not the cheapest) price. I felt they had really paid attention to ME as a customer, and as a person. After the sale, my account rep stayed engaged. When I said the weekly phone calls were too much, they asked about communication preferences. I said, “instant messenger.” Okay. I got a weekly IM from my account rep, Dan, checking in. Easy. When I did eventually need something, I didn’t go to the website, I sent an IM to Dan. Dan was the man. He took care of it. No order forms, no paperwork. Just easy service tailored for my needs. Then Dan left. I was devastated. He made my job so easy and he sent me cookies every Christmas. He was my guy. But then I met his replacement, Ted. And you know what? Ted was the man, too. Ted told me on our first call “I see you prefer IM – still want to connect that way? Here’s my handle.” The cookies kept coming. Two years later, Ted got promoted. I was worried, but I shouldn’t have been. Aaron had it down. He knew everything about me already, kept answering the IMs, and made sure I always got what I needed, when I needed it, and at a fair (although not the cheapest) price. He sent me a CDW-branded onesie when my first child was born. I bought EVERYTHING from CDW. When they didn’t have a cable I needed, I felt guilty shopping elsewhere. They won my heart, and my loyalty, by knowing me. Aaron moved on too. This time, I wasn’t worried. I realized it wasn’t Dan, or Ted, or Aaron that were great. It was CDW. They created a factory that churned out great people. They had systems figured out, processes organized, and their game together. Because of the experiences I had with each of these account reps, my loyalty has only increased because of the churn in my account managers. I realized I was dealing with a company that knew how to deliver a great experience, every time, no matter who I was dealing with. And now I have Rob. My fourth account rep in 16 years of doing business with them. We’re Facebook friends. I don’t IM anymore, because I have people that deal with tech for me these days. Every time my team brings me a quote for some tech that’s cheaper than CDW, I say no. Buy from CDW. My team saw the power of great CX in that moment. Creating great CX involves more than just the moments of interactions we have with clients. CDW was tracking the information they felt could be important to us. Did they know we would ask for it? Probably not, but they were ready to delight us just in case. And you know what – their attention to our needs saved us more money than we ever would have saved buying cheap. Great CX isn’t easy, but it’s not rocket science either. Ask. Pay attention. Anticipate. Demonstrate understanding. Be there and help. That’s value creation (and loyalty making) in a nutshell. What are the moments in your service delivery or client engagement where you can demonstrate these traits? 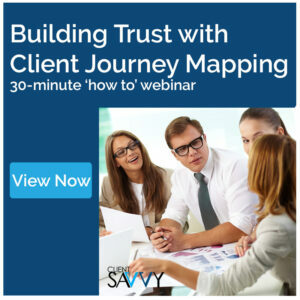 Click here to download Client Savvy webinar, Building Client Trust using Journey Mapping. 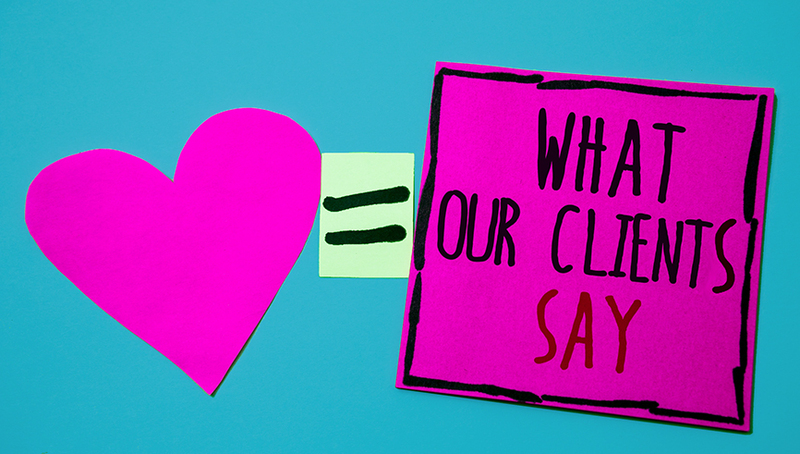 Delivering great CX can be as simple as understanding those moments in your clients’ journey where you have the chance to demonstrate you know how your clients feel and, like CDW, remind them why they love working with you without saying anything.